For another Throwback Thursday entry, I bring to you the renowned Carrot Cake from the first The Silver Palate Cookbook . The first book, originally published in 1979, and the follow-up, The Silver Palate Good Times Cookbook from 1984, were groundbreaking. No one before had jam-packed so many accessible yet adventurous ideas into one cookbook. 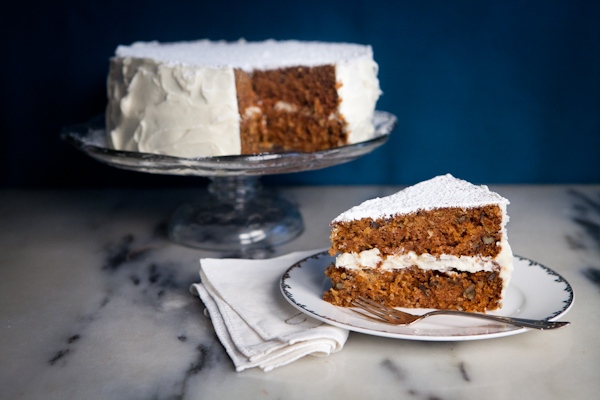 The Carrot Cake is unusual in that it uses cooked carrots, which lend a very moist texture. The cream-cheese-frosted sides and sugared top is the way the Silver Palate presents it, but you can frost the top if you like. These books, along with Maida Heatter’s books of the same era, have no pictures whatsoever and not only did they not suffer, they inspire with their descriptive words and the recipes themselves. Cook’s Illustrated takes the same approach today. By eliminating photographs, it makes the reader get into the recipe in a more direct way. It makes you think about the ingredients and the flavors and how you are going to approach creating the dish. I think it makes it a more intimate experience. You get to know the author through their words and truly understand what they are trying to convey. Reading about the Silver Palate Strawberry Mousse as part of a “European Send-Off Buffet” complete with Salmon Mousse, their famed Chicken Marbella, Rice and Vegetable Salad with Creamy Tarragon Dressing, Cold-Blanched Asparagus with a Red Wine Vinaigrette, and cheeses such as L’Explorateur and the Montrachet and Basil Torta, you feel like you are already at the party! That is the vibe with the Silver Palate books – 1980s excess through luscious flavors, textures and combinations. And by the way, in the Good Times book is one of my favorite recipes ever – you have to try the Three-Onion Casserole. Trust me. Butter, yellow onions, leeks, red onions, Boursin, Harvarti, Gruyere and white wine. Need I say more? For desserts from The Silver Palate Cookbook, try the Coconut Cake with a sour-cream frosting, the Orange Cake with fresh orange-juice glaze (presented as part of A Danish Brunch), the Grand Marnier and espresso-laced Chocolate Mousse and the Peach Cobbler topped with a peach brandy whipped cream. Adapted from THE SILVER PALATE COOKBOOK Copyright ©1979, 1980, 1981, 1982 by Julee Rosso and Sheila Lukins. Used by permission of Workman Publishing Co., Inc. New York All Rights Reserved. In the beginning, Sheila’s mother drove her famous carrot cake down to Manhattan daily from her Connecticut kitchen. 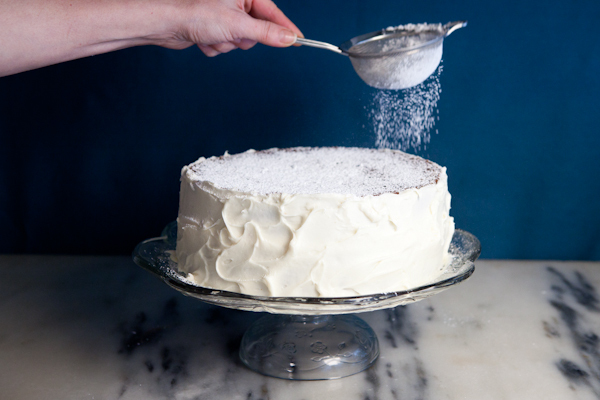 The cake became a Silver Palate classic; it may now become yours as well. For the cake: Preheat oven to 350°F. Grease two 9-inch layer cake pans lined with wax paper. Sift dry ingredients into a bowl. Add oils, eggs and vanilla. Beat well. Fold in walnuts, coconut, carrots and pineapple. Pour batter into prepared pans. Set on the middle rack of the oven and bake for 30 to 35 minutes, until edges have pulled away from sides and a cake tester inserted in center comes out clean. Cool on a cake rack for 3 hours. For the frosting: Cream together cream cheese and butter in a mixing bowl. Slowly sift in confectioners’ sugar and continue beating until fully incorporated. Mixture should be free of lumps. Stir in vanilla, and lemon juice if you use it. We used canola oil instead of the corn oil for a lighter flavor. We started with 1½ cups walnut halves (shelled), then chopped them. Pecans work well, too. Since sweetened long-shred coconut was the typical coconut available at the time of the recipe’s creation, that’s what we used. It is also easy to find in most supermarkets. We started with 1 pound of peeled “baby” carrots and simmered them in 1 1/2 cups of water until fork tender. Then we puréed them in a food processor fitted with a metal blade. You will probably have extra, but better than not enough. We chose to use pineapple packed in juice as opposed to sugar syrup for a fresher fruit flavor. Our cakes took almost 45 minutes to bake. You might try baking this at 325°F for more even baking as the cake is very dense. We did add the lemon juice to the frosting. The recipe offers no storage recommendations. We found that the cake lasted at room temperature under a cake dome for 2 days. Refrigerated, you might get an extra day, but bring to room temperature before serving.